Beach, sailing, boating, fishing, swimming, windsurfing and kayaking. Tayvallich is well known as one of the most sheltered natural anchorages on the West Coast of Scotland. Facilities for visitors include a slipway, moorings and a serviced pontoon. Carsaig Bay is a child-friendly beach with shallow water and small areas of sandy beach at high tide and a wide drying sandy bay at low tide - perfect for digging "sand castle cities"! The beach and sand dunes of Kilmory and Castle Sween are a delight for children and are approximately 8-10 miles away. Fishing is popular on both the Tayvallich and Carsaig sides and is also available in several Knapdale lochs with permits which can be acquired locally. Walking, hiking, sightseeing, art studios and cycling. The Tayvallich area has always had a great range of wild and scenic routes. In recent years, dedicated effort and funding have successfully achieved well maintained trails, illustrative signage, further expansion and support of Nature Reserves and the promotion of the ancient heritage of the area. 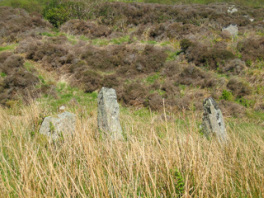 Kilmartin Glen has world recognition for its archeological monuments . Superb nature and forestry trails start literally from the door and Scotland's most beautiful (Crinan) Canal nearby has wonderful walking and cycling along its whole length. Oban, an hour away, offers a myriad of tourist attractions and is referred to as "Scotland's Seafood Capital" and the "Gateway to the Isles." Several well known artists live locally and have studios available to be visited. Tennis, golf and horse riding. A new astroturf tennis court has been built on reclaimed land that butts into Tayvallich Bay. It is sure to rate as a uniquely pretty tennis court! The court can be reserved in advance and the charge is £5 an hour. A 9 hole golf course is available 12 miles away with several scenic and well known 18 hole courses a day trip away. Several horse trecking stables are within a half hour drive. The immediate area around the house has been tended to the extent that shrubs, annual flowers, a south facing deck and a lawn enhance outdoor living. Otherwise the grounds are a natural landscape with rough tracks leading to the beach and to several viewpoints.